The promotional material for Batman: Arkham Knight promises us the chance to “be the batman”. Funny, I thought I remembered being the batman in the previous titles. Unfortunately, the feeling of retreading material from previous titles is a reoccurring theme in Arkham Knight. The game follows its predecessors diligently in tone and gameplay, which is to say it is a very respectable, competent game. However, the game offers few new elements to the series, and excellent features from previous titles are anemic and under-developed, here. The core experience is largely the same, and I’m just not convinced ‘more of the same’ is enough when we’re talking about the fourth installment of an established franchise. As far as gameplay goes, players familiar with the Arkham franchise will have no problem handling the waves of generic, weaponized thugs Scarecrow and dubious partner the Arkham Knight throw at you. Arkham Knight combat has a new feature, dubbed Dual Play, wherein the player can switch control from Batman to one of his allies. While cheeky, the feature doesn’t offer much gameplay depth as these characters play 90% identically to the Bat himself. Batman begins his long night on the job with many of the gadgets unlocked in the previous two titles. This includes the explosive gel, the Batclaw and the line launcher. Even some of the gadgets you find later in the game are ones we’ve seen before: freeze blast grenades, the electric charge gun, the remote hacking device. Call me jaded, but it felt very old-hat to encounter an environmental obstacle, watch a cutscene ensue, and acquire a device I had already acquired in previous adventures. Speaking of gadgets, Batman’s newest gadget doesn’t fit in his utility belt at all. 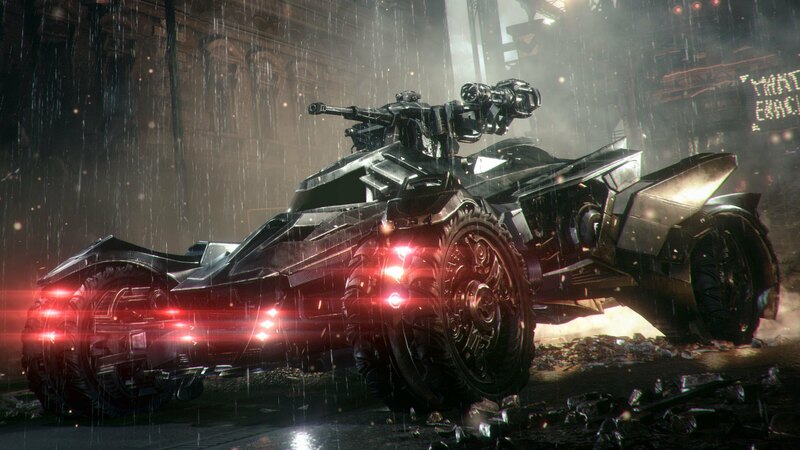 In case you’ve been living under a rock and missed the terribly unsubtle trailers and previews, the Batmobile is featured heavily in Arkham Knight. Don’t get me wrong, the Batmobile combat gameplay can be very fun and challenging. The vehicular combat is non-traditional. You roll around in multi-directional combat-mode firing heavy duty rounds at unmanned tanks (Batman doesn’t kill, remember) whilst dodging retaliatory laser-guided rocket fire. The Batmobile has jets that offer it high maneuverability, allowing you to duck and weave. Connecting with basic hits allow you to charge a power meter that you can use to unleash empowered finishers. It has a very old-school, arcade-y feel to it. 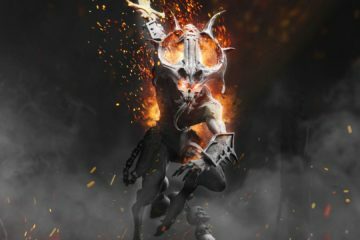 It effectively adds a third gameplay type to the franchise (in addition to the Combat and Predator gameplay segments of yore). That said, the game is very heavy-handed with the use of the Batmobile. It makes sense. The studio undoubtedly spent a ton of time developing the feature from the ground up, as it is unlike anything the franchise has featured. That said, I don’t want to Be the Batmobile. I want to Be the Batman. 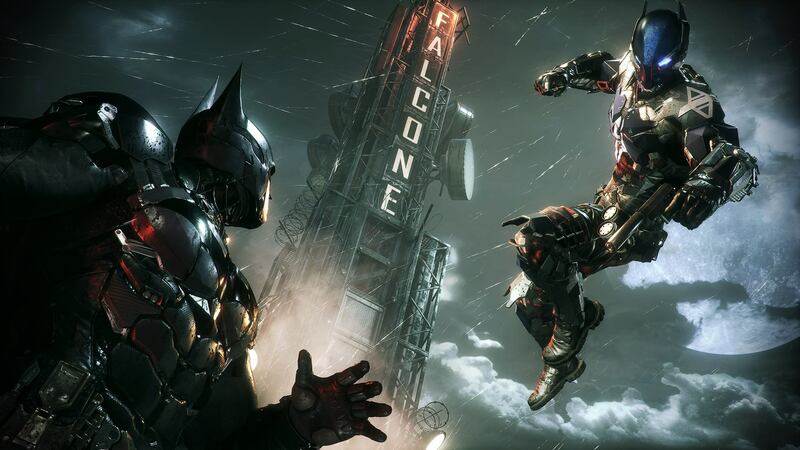 One key feature that was almost completely missing from Arkham Knight was boss fights. As I moved further and further through the game, I became increasingly alarmed at the lack of actual boss battles. There are only two encounters that could be loosely described as boss fights, and one of them occurs while you’re behind the steering wheel. Argh! This, combined with the lackluster gadget discovery, means the game lacked some of the core features that made the previous Arkham games great. Look, I enjoy beating the living justice out of groups of 20-odd goons as much as the next guy, but after a while, it becomes rote. I believe the franchise functions best as an updated metroidvania experience dressed in a coat of Batman paint. The series’ first entry Arkham Asylum (the best in my opinion) executed on this idea perfectly. I can forgive the studio for moving from a more contained setting to an open world. I can’t forgive the omission of key gameplay elements. If we draw the comparison between Arkham Asylum and Metroid, given an open world, the obvious inspiration to draw from would have been Zelda. I feel as if Rocksteady missed an opportunity. One thing that the game gets very right is its incredible immersion. You really do feel like the Dark Knight. The cinematic presentation is top-notch. Batman communicates to Alfred, Oracle and various other characters through a comms device in his wrist guard. These scenes are interlaced seamlessly into the gameplay and feels very organic, given the setting. The presentation is immaculate. Arkham Knight may be the most beautiful game I have seen on the Playstation 4. Batman’s cape ripples believably in the wind as he glides from rooftop to rooftop. Stormy weather leaves raindrops sliding down his bat suit. The city is alive with lights and sound. The always-present villainous mocking over loudspeakers or constant chatter of the local riff-raff serve as constant reminders that you are in a fully-realized world. I won’t say much about the story to avoid spoilers, but it is an excellently written adaptation of established canon events from the batman mythos. The voice acting is mostly superb. Kevin Conroy’s Batman was easily the dullest member of the cast, which is saying something. The game leans heavily on the shoulders of the impeccable Mark Hamill, who came out of Joker-retirement (Hamill had previously stopped playing the character to preserve his voice) in order to play the role in this game. Arkham Knight incorporates the narrative into gameplay in a very unique manner that really must be experienced first-hand in order to appreciate. While the core mechanics and gameplay content left me wanting much more, the artistic and narrative quality elevate what would have been just an okay game to a pretty good one. It did feel like the gameplay got second-fiddle to the narrative, though. 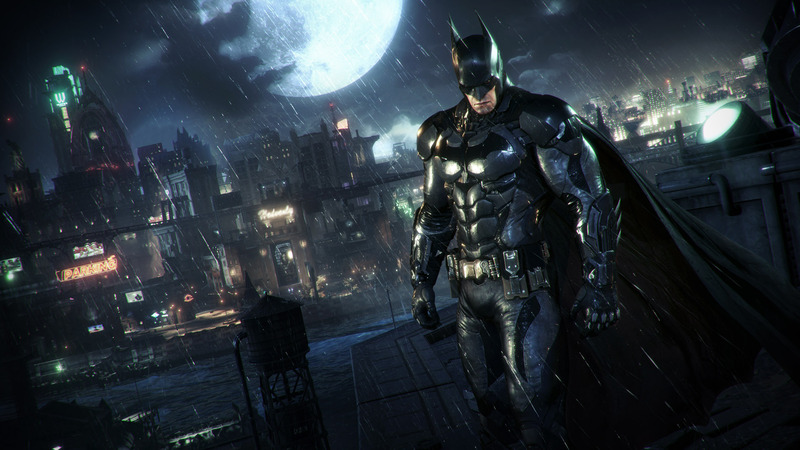 Moving forward, Rocksteady must not allow gameplay to be an afterthought. This game is good, but it could have been one of the greats. I can’t even be sure if the game’s redeeming qualities are enough to actually redeem it for people who don’t share my fanboyish enthusiasm for the Caped Crusader. Rumors are circulating that the studio’s next project will feature another prominent DC hero. I hope that Rocksteady can identify what made Arkham Knight fall short of greatness and iterate accordingly. Batman: Arkham Knight was not the Batman game we deserve.